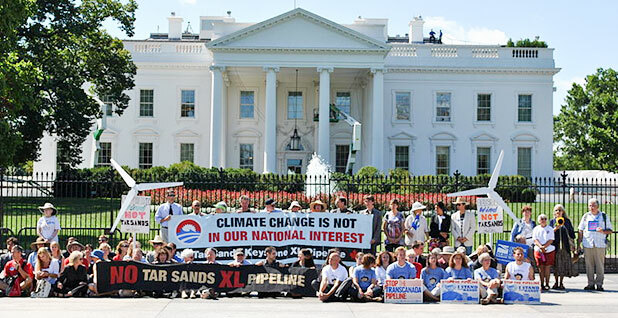 Opponents of the Keystone XL oil pipeline protest at the White House. President Obama decided to reject the project last year. Photo courtesy of Wikipedia. President-elect Donald Trump's advisers are looking to fast-track approval of the Keystone XL pipeline, with a top transition official reportedly planning to tour Canada's oil sands region as climate activists and landowners gird for battle along the pipeline's path. "There are a lot of things under consideration," a source close to the Trump transition team said. President Obama last year rejected the 1,700-mile pipeline from the oil sands of northern Alberta to the Gulf of Mexico, concurring with Secretary of State John Kerry's finding that the pipeline wasn't in the nation's best interest. Now, Trump's inner circle is considering scrapping a 1968 executive order that authorized Obama to make that call. "Anything like an executive order that is the product only of the executive branch is probably at risk," the source said. At issue is President Lyndon B. Johnson's executive order, which puts the State Department at the helm of determining whether cross-border projects — transmission lines, conveyor belts and other facilities that transport oil, coal and minerals — are in the nation's best interest. Trump could rescind the order and issue a directive that lays out a new permitting regime, legal experts say. Doing so would shorten and streamline permitting for cross-border energy projects while ensuring state officials and federal agencies like the Army Corps of Engineers conduct environmental reviews, said Chris Warren of the free-market Institute for Energy Research. "It's significant because that's where the pipeline was held up under the Obama administration, but it really doesn't make too much sense for the State Department to be involved in the permitting of pipelines," Warren said. "It doesn't mean pipelines wouldn't undergo environmental review; all it would do is pull back the authority of the State Department to say [whether a project] is in the national interest." Should that executive order be voided, Warren said legislation would be needed to ensure the decision isn't reversed. "There's been talk about legislation just for the approval of Keystone; that's one option here," he said. "I think Trump issuing an executive order is the right place to start, to rescind that one." Further highlighting Trump's interest in the pipeline, Kellyanne Conway, Trump's senior adviser, is slated to tour Alberta oil sands and attend a private fundraising dinner hosted by the Alberta Prosperity Fund, Canada's only conservative super political action committee, on Jan. 12, according to the fund. Some are expecting a Trump administration to go beyond Keystone XL. "I would expect to see a floodgate of new proposals come forward in the coming years for all sorts of infrastructure: pipeline, electric, roads, you name it," said Brigham McCown, who was acting administrator of the federal Pipeline and Hazardous Materials Safety Administration in the George W. Bush administration. "Certainly when it comes to energy infrastructure, there are a lot of plants on the drawing book that are much more likely to be brought forward under a Trump administration." But some experts said the market — not the incoming administration — could play a larger role in determining the fate of oil and gas pipeline projects. Dinara Millington, an oil analyst with the Canadian Energy Research Institute, said Keystone XL may not be needed after the Canadian government approved two oil pipelines slated to connect the country's oil sands region to the United States and other end users. Millington said the growth in oil sands production volumes will have sufficient take-away capacity for the foreseeable future given Prime Minister Justin Trudeau's approval of Kinder Morgan Inc.'s Trans Mountain and Enbridge's Line 3 expansion between Alberta and Wisconsin (EnergyWire, Nov. 30). Legal experts and analysts also cautioned against discounting grass-roots resistance around KXL. Foes of that pipeline have recently shifted their focus to the $3.78 billion Dakota Access pipeline in North Dakota. Activists who rallied against KXL acknowledge a Trump administration may not be swayed by protests, but they are vowing to fight on with state-level lawsuits and massive demonstrations, and by seeking leadership on Capitol Hill. Among their champions are Sen. Jeff Merkley (D-Ore.), Sen. Bernie Sanders (I-Vt.) and Rep. Keith Ellison (D-Minn.), who's in the running to chair the Democratic National Committee. "It will trigger a huge wave of opposition just like we saw the first time around," said Jamie Henn, a spokesman for 350 Action. "Everything from legal challenges along the pipeline route, fights over some of the eminent domain issues that took place in Nebraska that were never fully resolved because the presidential permit was rejected, and massive protests." Activists are also bracing for Trump's pipeline maneuvers. Jane Kleeb, who led the fight against KXL, warned that scrapping the State Department's role and pushing the approval process back to states could prove a "risky proposition" given that many local officials don't have the resources or expertise needed to review pipeline projects. While the Federal Energy Regulatory Commission oversees the permitting of interstate gas pipelines, Kleeb noted there's no similar federal agency for oil pipelines. The Department of Transportation's Pipeline and Hazardous Materials Safety Administration gets involved after an oil pipeline is built, she added. "If Trump does remove the State Department from the process, there's literally not a single federal agency that's in charge of the oversight of oil pipelines," Kleeb said. "Trump would essentially be saying there should be no federal review of oil pipelines. If that's his view, that should obviously send a big shock wave down to landowners whose property rights are right in the crossfire of all of these pipelines."